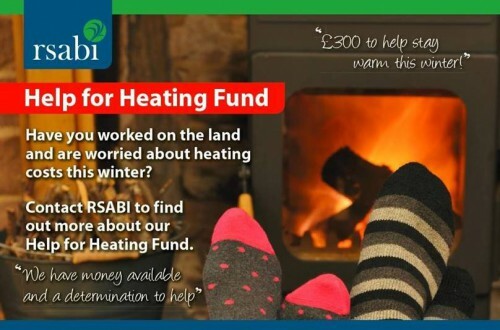 The RSABI “Help for Heating Fund”, launched at the beginning of December 2014, has an initial £30,000 available on a first come, first served basis to provide single grants, each of £300, throughout Scotland – the aim being to alleviate the effect of fuel poverty amongst people who have depended on land-based occupations. RSABI recognises that many rural households will be inadequately heated in the months to come. With the weather changing and winter around the corner, many people will be worrying about paying their energy bills. If you are no longer able to work and are worried about keeping your home warm this winter, please call RSABI on 0131 472 4166 for more information and an application form.